We Are The Evidence founder Dafna Tachover is an attorney both in New York and in Israel who received her degree in the UK. She also has an MBA and has had a diverse international legal and business career. 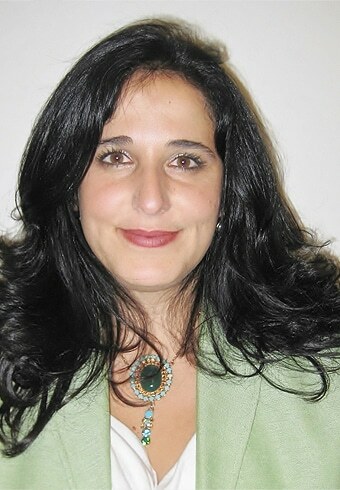 She gained a technical understanding of wireless networks and infrastructures as a communications and computer officer in the Israeli Defense Forces where she was the commander of the computer center for their Operations Center and Headquarters. In 2009, she developed electromagnetic sensitivity from wireless technology radiation. Since then, she has dedicated herself to exposing the epidemic of sickness caused by this technology; to protecting the rights of the injured; to eradicating the misrepresentation that wireless technology is safe; and to pursuing those who betray the public’s trust. She has also been fighting against the deployment of Wi-Fi in schools. Her work includes public speaking engagements, educating the medical profession, generating media initiatives and interviews, lobbying, consulting and litigation. She is one of the leading global advocates on this topic. Since 2012, she has been reporting about her work in a blog: EHS Fight Back. In July 2009, Dafna lived in Princeton, NJ with her then husband, who is an MD/PhD who worked at Princeton University. She planned to start a family and was about to start her consumer protection law practice. She was an early adopter and avid user of wireless technology, and subsequent to the purchase of a new laptop she started experiencing symptoms which were clearly caused by the use of the laptop. Her symptoms quickly escalated: she could not use her computer or cell phone; she could not be in her house and had to live in her car for seven months; and she could no longer be anywhere near wireless technology. The symptoms of electroensitivity were severe and debilitating. Her condition forced her to give up her career, divorce her husband and give up her dream of having children; she was forced into social isolation. After two years of pain and struggle, Ms. Tachover moved to the Catskill Mountains of New York, where she found areas with little or no radiation. There she began to heal and act. Read more about her personal journey in New York Magazine. Watch her journey to find a house without radiation in a Time Magazine movie. After learning of her diagnosis, Dafna applied herself to discovering all she could about the wireless technology she once admired and depended upon. With the help of her then MD/PhD husband, she read hundreds of papers and researched numerous documents testifying to the harmful biological effects of radiofrequency and microwave radiation, and she spoke to hundreds of people who had also been injured. She learned that the danger of wireless technology had been proven scientifically decades ago and that the public had been denied the facts, resulting in an epidemic of sickness. The book “Disconnect” by Dr. Devra Davis left no doubt in her mind that had she known what she knows now about wireless technology, she would not have used it before she got sick. These truths were a shocking realization and compelled Dafna to act. Her first action was to take the Israeli government to court for harming schoolchildren with the massive deployment of Wi-Fi in schools. Supreme Court Case to ban Wi-Fi in Schools – In 2012, Ms. Tachover initiated a case in the Israeli Supreme Court asking to ban the use of Wi-Fi in schools. While working on this case, she exposed an existing epidemic of electrosensitivity among children and found more than 200 of them sick in six schools alone. Her case aroused national and international interest among parent groups, Parliament and the media. Press here for the petition to the Court. Watch a TV interview about the case. First Acknowledgement of ES by the Israeli government – In the actions taken prior to the submission of the case, following her correspondence with the Inter-ministerial Committee on Wi-Fi in Schools, the Committee acknowledged ES. It was the first governmental acknowledgment of ES in Israel. Minister of Health letter objecting to Wi-Fi in schools – In addition, following a letter warning the Deputy Minister of Health of the upcoming lawsuit, the Acting Health Minister wrote a letter to the Minister of Education urging him not to install Wi-Fi in schools, as the harmful health effects could cause damage for generations to come. Press here for the Minister of Health’s letter against Wi-Fi in schools. Submission of Amicus Brief on behalf of 94 organizations – In 2014, Ms. Tachover represented 94 organizations from 22 countries in submitting an amicus brief in a case in New Mexico concerning a man with an electrosensitivity. Children Rights Committee demand the removal of Wi-Fi from Schools – In 2015, Ms. Tachover took part in the efforts to get a hearing in front of the Children’s Rights Committee in the Israeli Parliament and spoke in the hearing. Following the hearing, the Committee was convinced of the harms of Wi-Fi, and determined that the installation of Wi-Fi in schools was a violation of the rights of children and parents and called for its removal. Press here for the Committee’s Protocol. TV Documentary of ES & Wi-Fi and the removal of Wi-Fi from Schools in Haifa – In 2016, Ms. Tachover was involved and featured in a TV documentary for an Israeli TV channel called “How We Are Killing Ourselves – Wireless Radiation” on the epidemic of ES and Wi-Fi in schools. The documentary created a lot of public buzz. Three days after the show aired, Mr. Yona Yahav, the mayor of Haifa (the 3rd largest city in Israel and an international hi-tech hub) announced that Wi-Fi would be removed from schools. Haifa was the first city in the world to protect the health of its children by removing Wi-Fi from schools. Press here to read about the removal of Wi-Fi from schools in Haifa. TV interview on Channel 1 English News “Parents Fight Wireless Radiation in Schools”. New York Magazine article “What It’s Like to Be Allergic to Wi-Fi” featuring Dafna’s ES journey. TV Documentary “How We Are Killing Ourselves – Wireless Radiation”. Time Magazine Movie – “Searching for a Golden Cage” about the difficulties of ES. Radio interview with KBOO about the Wi-Fi case.